Biotinylated Human PD-L2, His Tag (PD2-H82E8) is expressed from human 293 cells (HEK293). It contains AA Leu 20 - Pro 219 (Accession # AAI13679). The protein has a calculated MW of 25.2 kDa. 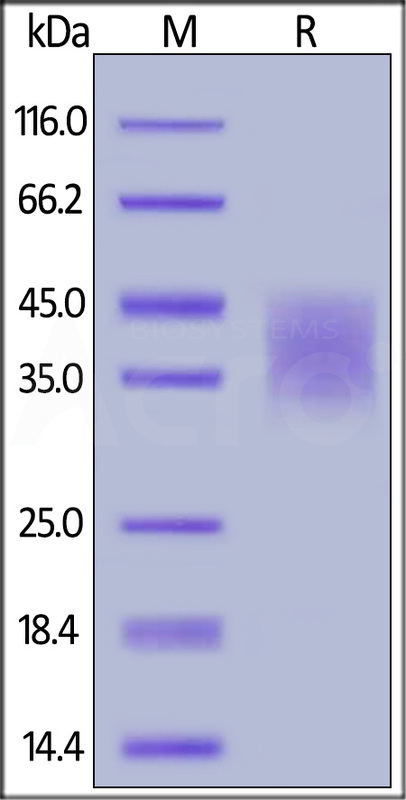 The protein migrates as 33-45 kDa under reducing (R) condition (SDS-PAGE) due to glycosylation. PD2-H82E8 works best for experiments that test the binding between PD-L2 and candidate antibodies, such as biopanning and other relevant assays. This product is NOT suitable for testing PD1-PDL2 binding. For this type of application, we strongly recommend you to choose PD2-H82F6 as an alternative. Biotinylated Human PD-L2, His Tag on SDS-PAGE under reducing (R) condition. The gel was stained overnight with Coomassie Blue. The purity of the protein is greater than 95%. 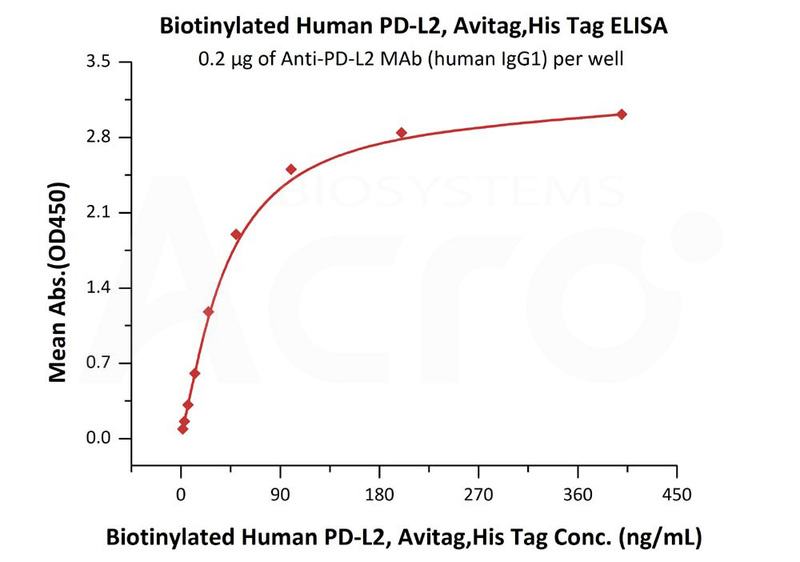 Immobilized anti-PD-L2 mAb (human IgG1) at 2 μg/mL (100 μl/well) can bind Biotinylated Human PD-L2, Avi Tag (Avitag™) (Cat. No. PD2-H82E8) with a linear range of 3-50 ng/mL (QC tested). Programmed cell death 1 ligand 2 (PD-L2 or PDCD1 ligand 2) is also known as Butyrophilin B7-DC, CD antigen CD273, which belongs to the immunoglobulin superfamily or BTN/MOG family. The expression of PD-L2 is up-regulated by IFNG/IFN-gamma stimulation in monocytes and induced on dendritic cells grown from peripheral blood mononuclear cells with CSF2 and IL-4. PD-L2 Involved in the costimulatory signal, essential for T-cell proliferation and IFNG production in a PDCD1-independent manner. PD-L2 interaction with PDCD1 inhibits T-cell proliferation by blocking cell cycle progression and cytokine production. (1) Tseng S.-Y., et al., 2001, J. Exp. Med. 193:839-846. (2) Latchman Y., et al., 2001, Nat. Immunol. 2:261-268. (3) He X.-H., et al., 2004, Acta Biochim. Biophys. Sin. 36:284-289.